This Ajinomoto CookDo premixed sauce is made in Japan for cooking minced pork with eggplant. It is a perfect blend of Chinese Chili paste and vinegar makes a delicious hot and sour sauce. Simply add to stir-fried minced pork and eggplant. Versatile "COOK DO" Premixed Sauces make it incredibly easy for you to prepare the most popular, most authentic Chinese entrees at home. 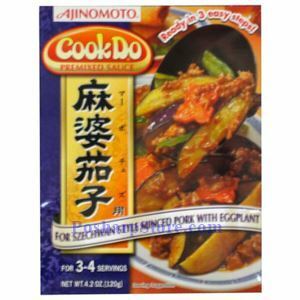 Each "COOK DO" Premixed Sauce blends the herbs and spices characteristic of a particular Chinese favorite, so you can transform your own stir-fried meat, fish or fresh vegetable dishes into Chinese restaurant-style entrees in a matter of minutes.